Review: Isabella’s Garden by Glenda Millard and Rebecca Cool. I met Glenda Millard some time ago, at a writers event at Stoneman’s Bookroom in Castlemaine ( a lovely bookshop by the way.) Glenda had us all in stitches as she told tales about how she grew up in the country and her journey to becoming a writer. Glenda was a great storyteller in every sense of the word and I looked forward to reading more of her work. Isabella’s garden is set to the rythm of The House That Jack Built. It begins with seeds ‘that sleep in the soil all dark and deep,’ and continues through the plant life cycle….but in such a beautiful way. The clouds ‘cry the rain,’ the sun ‘kisses the clouds,’. The shoots grow and as the season progresses flowers ‘waltz with the wind,’ chicks hatch and birds sing. As the seasons change, the leaves turn crimson and gold and then to winter, where Jack Frost ‘encrusts the garden with glisten and glimmer.’ There are some books that just beg to be read aloud and this one does. It’s not hard to see why it one the speech pathology book of the year award. Rebecca Cool’s illustrations are vibrant and each page has a sense of movement, with a breeze seeming to blow from page to page. She uses a mixture of acryllic paints and collage. I’m cheating here and have looked on the Walker books website (I’m not arty you see!) I was looking for the right words to describe the illustrations and there it was ‘reminiscent of European folk art.’ On a simple emotional level, they made me feel happy. I can see this linking in well with the Stephanie Alexander Kitchen Garden Foundation and I’m sure that the schools involved in this program are already familiar with this story. For those not familiar with the program, I suggest you take a look. I had a great afternoon at East Bentleigh Primary School last year, when I visited the school to write an article on their free range chickens. The children took me on a tour of their garden and showed me the weeks menu and the tasty treats they were cooking, based on the produce they had grown. Seed germination, seasonal change, growth and life cycles are the science themes involved in this book, with lots of opportunity for cross-curriular literacy and art activities. Walker haven’t produced classroom notes for Isabella’s Garden but you can find out more about the story behind the book on their website here. You’ll also find a colouring sheet to download. You could perhaps try a little collage too. Doing a quick hunt around on-line, I also found this link to a jigsaw puzzle, an on-line plant part labelling exercise and matching exercises about seasons. It’s part of a website by Irene Buckley, who has produced resources relating to literacy for a number of books. You might like to read a much more sophisticated review than mine at the Book Chook…where you’ll also find links to some activites involving germination of seeds and gardening activities. Below are links to the National Curriculum, where it fits nicely into both the Biological Science and Earth Space Science sub-strands in the early years and also the Science Inquiry Skills strand. Today I’m reviewing somewhat of a cross-over book. It looks like a picture-book…and of course is..but it’s a non-fiction book which is part of Walker Books’ Nature Storybooks series. Bilby Secrets, written by Edel Wignell and illustrated by Mark Jackson, is the story of the Greater Bilby. It is told in narrative style, with supporting factual text on the same page. The factual information is presented in a different font to distinguish it from the story-line itself. Make sure if you’re reading it aloud, you stick to the non-italicised text! This is a simple, linear narrative as Baby bilby progresses from birth in the burrow to being able forage on his own. Set in the Pilbara, the deep blues of the night sky and the iron-oxide reds of the sand and rocks create a mysterious and sometimes dangerous night-time world.There are grubs and insects, owls and snake, lizards and cockatoos…great for a game of spotting the species! A hungry fox also threatens the bilby’s survival. What I like about this story as a science teacher, is that there is no anthropomorphism…baby bilby doesn’t have a name and he doesn’t have human-like thoughts. It’s a straight up tale of survival, competiton and habitat. Walker Books are doing a great job of preparing curriculum ideas for teachers. They are comprehensive, providing not only background information on the author, illustrator and the subject matter but also useful activities which you can put straight into practice. You can download classroom ideas here. There are a range of activities to suit a variety of ages…from more challenging research activities looking at the impact of settlement and introduced species on habitat and survival , to ideas about creating a diorama to show the bilby’s habitat. The notes also examinge the way in which bilbies live underground, thier physical characteristics and there are some links to bilby conservation sites for those seeking extension actities. Lots of cross-curriculum activities, including some language activites discussing the contrast between the descriptive/storytelling style of the narrative and the informative/ factual style of the supporting text. Also available for download from the Walker Books site is a stencil for younger readers to make there own bilby ears and a song to be sung to the tune of Waltzing Matilda. When I first began compiling this list of resources for teachers, I surveyed writing colleagues who were also primary teachers to see what their favourite books were. Again and again, the same books and name kept popping up…Jill Morris. A great testament from her peers. Jill Morris founded Greater Glider publishing in Melbourne in 1983. She began her writing journey creating scripts for TV, radio and theatre, later branching out into writing for children. Jill creates books for both the Curriculum Corporation and Greater Glider. Her books have strong environmental theme and are Australian classics. Jill now lives at the Book Farm in Queensland, where she hosts school visits and writing workshops. When I first contacted Jill, she generously sent down a number of her titles and as I opened the package I knew I was in for a treat. There is a real sense of quality in the presentation of these Great Glider publications. 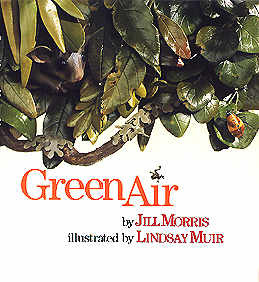 Green Air is one of Jill’s older books…I’ll be reviewing some of Jill’s other titles at a later date. Green Air is the story of Silus the frog, who lives in a lush tropical forest. This book is very visually appealing…with rich browns and greens which simply drip with moisture. The effect is produced by the unusual illustration process using 3D clay sculptures immersed in water. Green Air was written by Jill to suit the medium of illustrator Lindsay Muir, a clay sculptor who runs workshops in making frogs and their habitats out of clay. We first meet Silus as he swims to the surface to catch his first dragonfly. Using the words ‘piccabeen palms’ and ‘booyong trees’ firmly locates this book in the sub-tropics. It made me want to quickly google what they looked like and I’m sure it’s the sort of thing that your students would love to do too. Silus meets other creatures in his habitat; the names of which are shortened versions of their scientific names. Chloris the red-eyed tree frog is Littoria chloris; Phyllurus the leaf-tailed gecko is Phyllurus cornutus and Dendre the tree snake is Dendrelaphis punctulata. In fact, Silus himself is Rheobatrachus silus, the Southern Gastric Brooding Frog. This could lead to a discussion on how species are named , between scientific names and common names and why scientific nomenclature is used. The really fascinating part of course is the mating/breeding process! Silus fertilises the eggs but the female swallows them. They grow in her stomach and eventually she regurgitates them. ‘Green Air’ itself refers to the forest around Silus’ pool, to which he returns after being swept downstream to the ‘Yellow Air,’ where rotting and decomposition is occurring. This story fits neatly into the biologicalsciences sub-strand of the National Curriculum, as it addresses areas such as habitat, how animals get their food, adaptations…Chloris can climb but Silus can’t. It would lead into interesting discussions at the year 4 level, which looks at how species have offspring. It’s a great educational resource… but above all it’s a great read and is a story that can be read alone or shared with parents too. Tagged as australian animals, biological sciences sub-strand, environmental education, frogs, greater glider publications, Jill Morris, Lindsay Muir, national curriculum, primary science. Ah, gosh, sometime I wonder why I set myself up for these things! I’ve never written a review before and have often felt intimidated about the whole thing. I’ve made the blogsite though, so I’d better get started. Over the next few weeks I’ll be reviewing some of the books that I’ve been supplied with by publishers and authors alike. All of them will have some links to science…some more tenuous than others! Many of the books will be Trade picture books, which for those not up on publishing terms, essentially means that they are largely available through bookstores. However, I’ll also look at Educational books, which are those primarily developed for use in and marketed to schools. Today I’m reviewing a small series of books, Science At Play, published by Five Mile Press. First published in 2009, they compise a set of four hardback story books wirtten by Meredith Costain and illustrated by Kate Curtis. This is an early learning series which introduces children to simple scientific concepts. A simple text links a number of ideas around a central theme, with Molly, Max and their dog ‘Bear’ exploring their world through play.Each page contains a single, simple sentence with a double page spread illustration. It’s the sort of book that a child developing confidence with sentence structure could read for themselves or as part of a class activity. At the back of each book is a set of parent and teacher notes, with a simple experiment which could be completed in the classroom or at home. Molly’s Rainbow: A rainy day at play, follwed by the sun coming out. Bear and Molly note the appearance and disappearance of a rainbow. Notes at the back discuss how white light from the sun is split as it passes through water droplets. A simple explanation of diffraction and how different colours of light are bent by different amounts. Bear’s Bright Idea: Bear and Max are playing football at the park. It’s hot, then cold again. Exercise, sweating, goosebumps,wearing clothes and drinking are all discussed in terms of keeping the body temperature constant. Teacher/Parent notes discuss in more detail aspects such as dogs panting to keep cool and why the hairs stand up on our arms to trap heat. Contains an experiment where children can make their own simple thermometer. 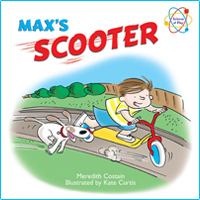 Max’s Scooter: Max is learning to use a scooter and needs to apply forces to stop, start and change direction. A very simple discussion of Newton’s Laws, including friction in the teacher/parent notes. Suggested activity is making an obstacle course. Tango’s Surprise: Max and Molly look at balancing forces as they balance on a see-saw. In this one, I find hte teacher’s notes are a little confusing..objects have mass but this isn’t explained. It’s the science teacher part of me,lol! The notes continue to talk about weitht in terms of balancing forces on the seesaw. Acitivity at the back suggests making a seesaw and making predictions for a number of objects to see which is the heaviest and which is the lightest. These books would suit the 4-6 early reading age group and gives some fun ideas for the parent or teacher to foster a dialogue about some of the ideas raised. What a lot of books! Earlier this year, I presented at the Primary Science Teacher’s conference on using picture books in enquiry learning. It began as an idea to promote George and Ghost, a picture book I had written while living in the UK. With a UK publisher, there seemed limited opportunities to promote it here in Australia. I wrote up a proposal for a session at the conference, pressed the send button and then spent the next few weeks thinking WHAT HAVE i DONE! Once the proposal was accepted, I had to come up with a package that was going to fill in an hour without boring the pants off people.Linking literacy and science, I had to come up with some books other than my own. I began quizing friends who were teachers and other writers about which books they knew about with science themes and used this as a scaffold for my presentation. I was fairly nervous and wasn’t sure whether I’d done a good job…especially when one male teacher had his back to me the whole session and was working on his laptop! Sometime you wonder don’t you! I was really pleased with the feedback from the original conference but put it all behind me, until I was asked to present again in November. As I’d left the last conference I’d sworn to myself never again! Famous last words…I’m now presenting at STAVCON in November. I’ve got a better idea in my head now about what I want to say and to help me not be so scared, I’ve asked Claire Saxby to come along and talk about some of her books. ‘There Was An Old Sailor,’ is one of my favourites. So now, I’ve advertised the session and lots of people have supplied me with copies of books, curriculum notes etc. I’m making a list of resources for teachers to use, which will be a work in progress on my website. As a thankyou to those who’ve provided me with material, I’m going to use this blog to review books with science themes. I’d love people to comment and let me know what they think and whether any of the material has been useful.